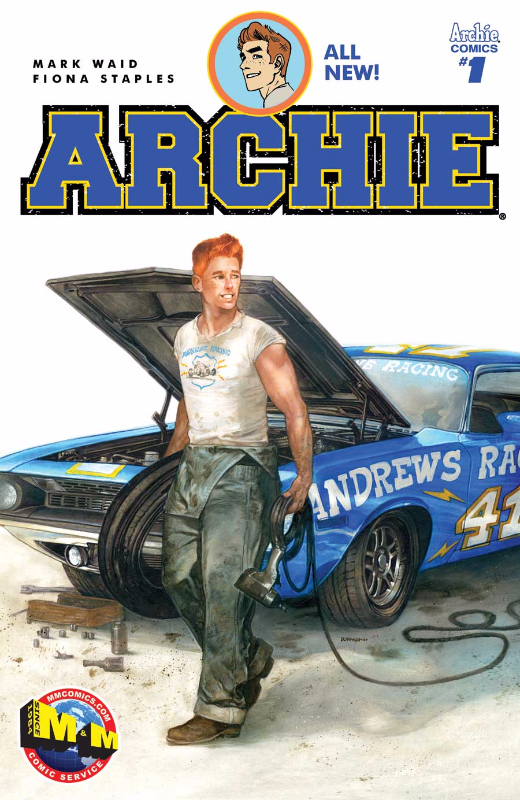 And Now for Something Completely Different: A Dave Dorman ARCHIE COMICS Cover! ARCHIE Comics has just revealed all of their Variant ARCHIE #1 covers. I am happy to say M&M Comics had me do the art for their shop’s variant! (We worked together on the Marvel STAR WARS #1 Variant as well!!) So, I am now able to post the artwork for all of you to see! It was a whole lot of fun working on this cover and great to be able to give ARCHIE a more realistic look for his fans. He and the gang at Riverdale are such famous pop culture icons, and I hope I did him justice. Both M&M Comics and I will be offering this Limited Edition Book for sale. Keep your eyes here for an announcement coming very soon! And please enjoy “something completely different” from the Studio of Dave! This entry was posted on June 5, 2015 at 10:11 pm and is filed under Chicago Comic Book Artists, Collectibles, Collections, Collectors, Comic Book Art, Comic Book Artist, Comic Book Convention, Comic Book Cover Art, Comic Books, DAVE DORMAN NEWS, Entertainment, Fan Culture, Geek, Geek Culture, Illustration, Nerd Culture, Painting, Pop Culture with tags Archie Comics, Comic Book Art, Comics, Comics Industry, Dave Dorman Art, Dave Dorman Comic Book Covers, Entertainment, FaceBook, LinkedIn, M&M Comics, Marvel, Nerd Culture, Pop Culture, Publishing, social media, Twitter, Variant Covers. You can follow any responses to this entry through the RSS 2.0 feed. You can leave a response, or trackback from your own site.